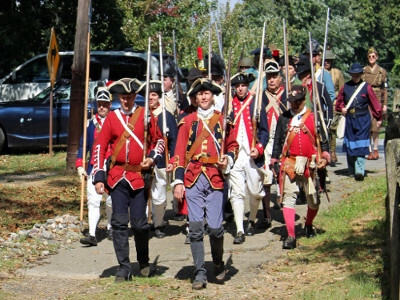 Military Timeline and Veteran's Recognition Ceremony - Paoli Battlefield Preservation Fund Inc.
Join us on Saturday, September 20th 2014 as we present an American Military Timeline starting at the French and Indian War and going through to present day. With the help of our friends from Historical Military Impressions see re-enactors from the French and Indian War, the Revolutionary War, the War of 1812, The Civil War, The Spanish American War, World War I, World War II, Korea, and Vietnam, in camps and displaying the dress and items they carried into battle. Interact with the soldiers, see the weapons they used and learn about the clothing and other gear that these soldiers needed to outfit themselves on the battlefield. Live firing exercises will take place throughout the day, as well as many other programs. Join the soldiers as they march into camp at 10:30am and then visit each of the camps. Learn about many of our local historical sites, learn crafts with special demonstrations, and buy goods from the craftspeople that will be at the battlefield. Author Bruce Mowday and Michael Harris will be signing their books for purchase and donating their proceeds to the battlefield. See Ben Franklin demonstrate his great inventions. We’d like to thank our food vendors Cafe Buno and Subway which will be selling food and drinks to everyone. Our good friends at the Colonial Plantation will have kids crafts and games to share with the family. Take a family keepsake photo at our special cutouts at the battlefield. Register your kids with our Paoli Passport. This program will have your children tour each of the camps and asked questions to the re-enactors to get the answers needed to win prizes. Everyone entered will win a prize pack, but we will have a larger prize drawing near the end of the day. Tour the Paoli Battlefield and learn all about the battle that took place here and why it was coined the “Paoli Massacre” by the patriots. Stop by and see Randy Brown of the Valley Forge Blackpots, as he demonstrates cooking near his replica wagon. Experience a Duel between a loyalist and a patriot and have your kids participant in our children’s musket drills. To close out the day we will have a veterans recognition ceremony. State Representative Duane Milne and others will talk about the history and sacrifice our fighting men and women have faced keeping our country free. Our re-enactors will march out of camp and will then lay wreaths at the mass grave site of the 52 patriots who perished during the Battle of Paoli on September 20-21, 1777. A bugler will play taps, a bagpiper will play Amazing Grace, which will then be followed by a firing salute by our re-enactors. Admission is by a donation of $8.00 per person, children are $5.00, and a special family rate is $20.00 (up to 5 people).